I love reading books to Harry, I really do. But sometimes I do sigh inwardly at the request to read the same book over and over again, or when I'm ready for bed and the story that he chooses is the longest one on the shelf. I'd also love to have the imagination to be able to make up my own stories for him. I've seen lots of ideas lately online (thanks Pinterest!) for various objects that can be made to prompt story telling, and seeing large numbers of bottle caps scattered across the living room floor gave me the final push to put together some of my own, using milk bottle caps. Most recently I've seen story stones and story cubes and they are absolutely beautiful. For my take on the idea I've simplified enormously by just using small pictures cut from magazines and greeting cards and gluing them on to the bottle caps. We save the milk bottle caps for recycling, and so we generally have lots about before I get round to taking them away. You could also use small pieces of cardboard, wood, tiles, or anything really with a flat surface. The pictures came mainly from free magazines and catalogues. To make it more personal to your child you could add photographs of family members or pets, or places and objects important to the family such as the house or a favourite holiday destination. I tried to choose pictures which would prompt some action in the story, for example some pictures of houses and transport. I've also included pictures of children, animals and familiar objects. Some of the pictures could have several meanings, for example a shoe could represent the object itself, or something more abstract such as a journey. A heart could represent not only romantic love, but also friendship or family. I've included a butterfly, which I used as a way to lead a character towards something interesting, and a clock to introduce a concept of time. I made 30, and I could have made many more (and I may yet do so!). When you are ready to tell a story, choose four or five of the pictures. You can let your child choose them, or choose them yourself at random without looking. Then just make up a story based around the images. You can base your story upon a person or animal that has been drawn out, or make your child the centre of the story. Youwill probably notice that the stories you come up with are repeated by your child in their role play, and if you start giving the characters names make sure that you remember them for the next story (your child will!). 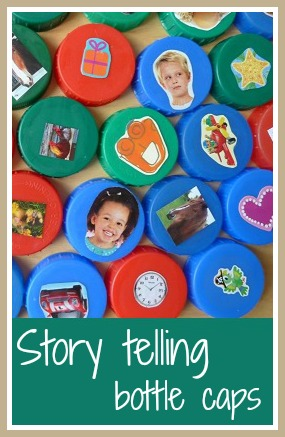 While you are telling the story, ask your child to join in and make suggestions. Harry absolutely loved this activity, and requested story after story. To my surprise I also really enjoyed making up my own stories. I made him select the pictures with his eyes shut, but I could usually see him peeking, especially once he realised that there was a dinosaur in there waiting to be chosen! I'm going to store these in a bag or box on the bookshelf so that they are just as accessible as our books. We've been having a lot of fun with them!